There’s just seriously not enough time in the day to get it all in . . . so what do we do with those kids that need extra fine motor practice? I’m not a huge fan of homework in kindergarten. I don’t like to send things home with my kinders. I would prefer they are outside playing or spending time with their families. But really, sometimes 10 minutes of fine motor exercise at home can mean the difference in finding success in kindergarten with writing and months and months of struggle and frustration. So what can we do to ‘get’ those 10 -15 minutes of additional exercise? Well, there are a couple of things you can do actually. Initially, I think it’s always helpful to educate all your kinder parents with what ‘fine motor’ skills are and why they are important. So I send home a simple little brochure at the beginning of the year just to give parents a heads up. It’s often surprising for a parent of a really bright child to hear that their child is struggling, because they can’t hold a pencil. This little brochure gives them an understanding of fine motor skills and why it’s an important thing to master in kindergarten. I find that most of the time, parents want to help their child be successful. It’s just sometimes they really need someone to point out ideas and activities that will work at home. They generally appreciate having a few tips to help them get started and this little brochure can do that. The second thing I like to do is to have a couple of Fine Motor Home Kits made up. These are simple, little inexpensive kits that students take home for two weeks and then bring back to me. This post contains affiliate product links. Before sending the kit home with a child, I always have a conversation with their parents just to let them know that I think perhaps their child could benefit from a bit of additional practice at home. I make sure they are ‘on board’ with the plan and understand that their child should pick only one activity each night and work at it for no more than 10-15 minutes. When they get the kit home, it will have a myriad of activities from which their child can choose one. I say one each night so that all the items aren’t pulled out and lost or mixed up. Parents are generally really good about this, and I haven’t had any problems with lost pieces. There is also a ringed set of task cards included in the kit as well. These show parents and students exactly what items are used for which activity and it explains how to use them. All the activities fit inside my little Steralite Carry Tote, safe and snug. It’s small enough for little ones to carry on their own or pop in their backpacks, but big enough to hold everything I need. 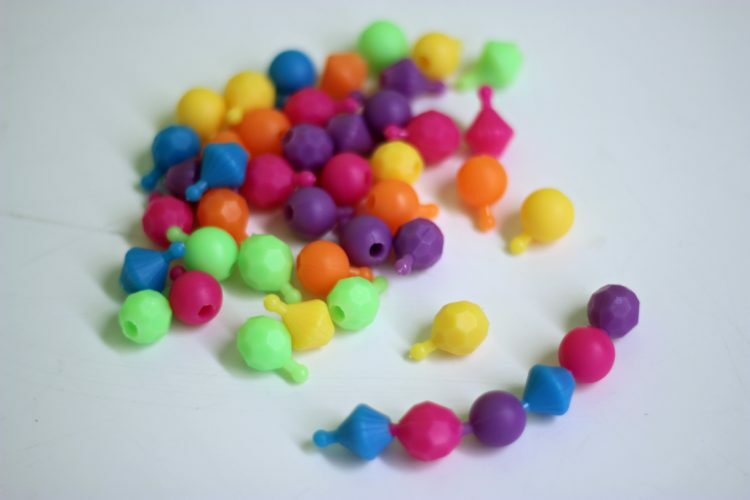 I like to include popper beads in my kit because they are engaging, colorful and, most of all, boys and girls alike enjoy using them so I know it will be an activity they want to do. To add a bit of a challenge to the activity, I suggest that students use the color or shapes to make different patterns. 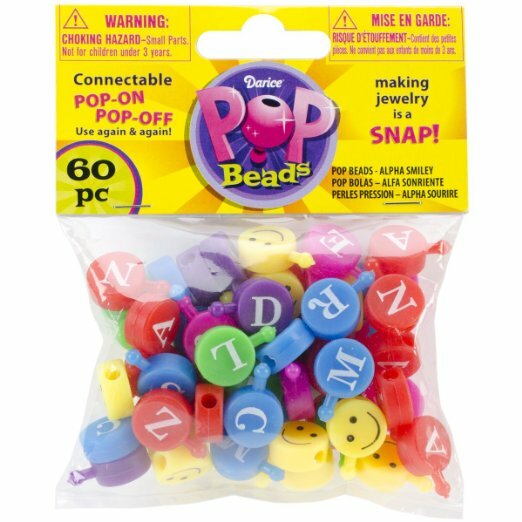 You can sometimes find popper beads at craft stores, and they are also available on Amazon as well. I used a small bag of 17o beads from Amazon to make three different kits. Also, get this, one reader told me there are Alphabet Pop Beads. They’re already in my Amazon cart! Paper hole punches are the ‘great silencer.’ No kidding! If you want a room full of quiet kinders, hand them each a paper hold punch. (I actually have a class set.) Just punching holes in a piece of paper is somehow mesmerizing to them and, at the same time, such a great tool for building those grasping muscles. 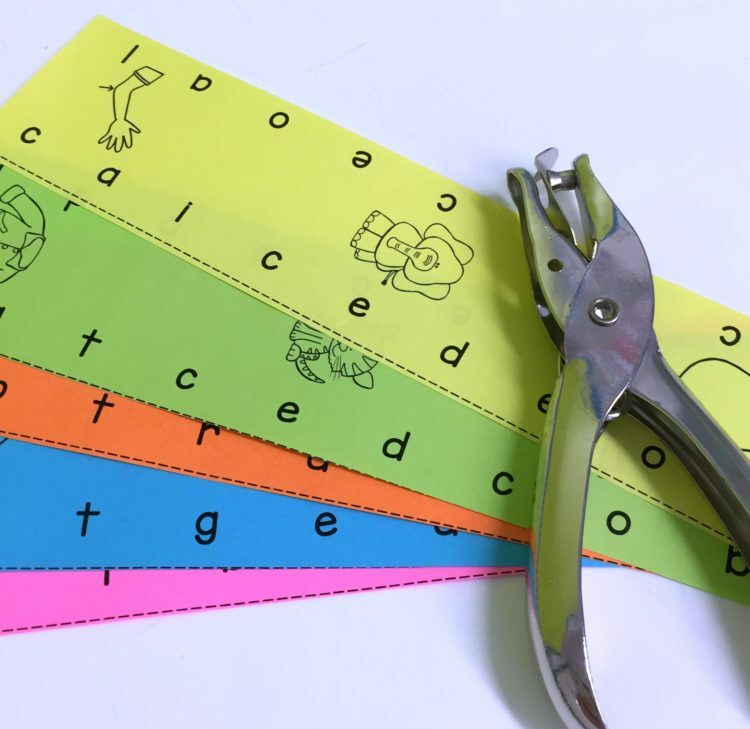 I’ve included the added challenge of ‘punching out letter sounds’ as part of the kit’s hole punch activity. Students look at the pictures on the strip of paper, identify the beginning letter sound, and ‘punch out’ any letters that are not the beginning letter sound. Paper hole punches are pretty easy to come by. You can pick them up at any department store or office supply store. I ordered a class set from Amazon a couple of years ago just so I’d have the opportunity to capitalize on those ‘great silencer’ moments. Bulb syringes can be found in the baby section of your local department or dollar store. They are super cheap and a ton of fun. 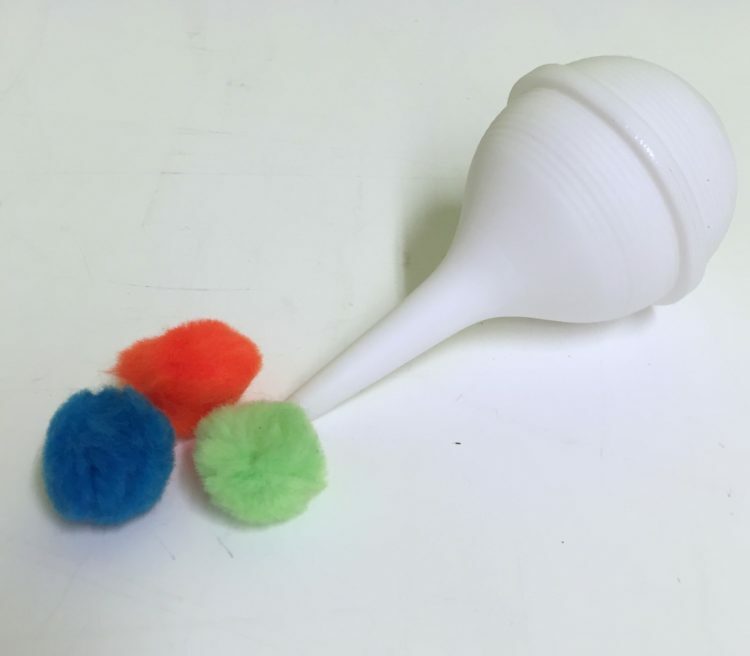 If you’d like, you can change a syringe for a turkey baster, and it has the same effect. 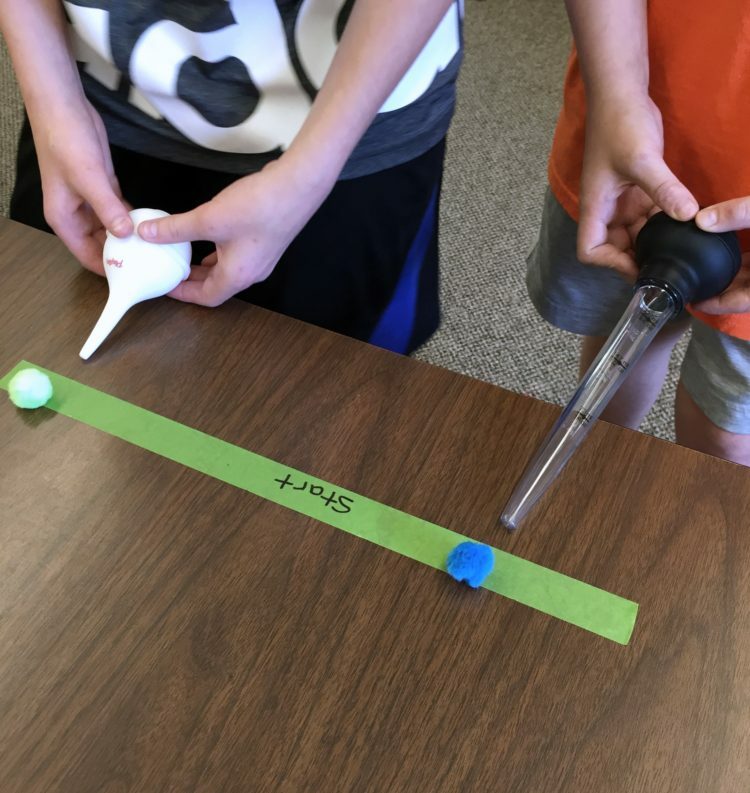 Having your students pinch the bulb repeatedly while pointed at a puff ball makes for a fun and engaging race. The motion needed to push the air out of the bulb helps work those pincher muscles, and it’s just plain fun. Until recently, I always made these munchy mouth tennis monsters with your run of the mill, everyday yellow-green tennis balls. But then a friend told me about these oh-so-cute animal print tennis balls that are actually for dogs, and I knew my kinders would go crazy for them. You’ll have to use a knife (It seems to work best if I use a serrated knife . . . just be careful, ok!) to cut the mouth and then simply hot glue google eyes to the front. It is surprisingly challenging for students to get that mouth open. They want to push it against their body and against the table, but I remind them that they have to ‘pinch’ the mouth open for the monster to get a good bite. To make it more challenging and engaging, I play a game where two students get the same amount of little mini erasers (I like to use ones from Oriental Trading. They last forever and I can make quite a few sets.) Each player takes turns rolling the dice and reading the number. That is the number of themed erasers (I used fish in the picture above.) that they feed their monster. The first person to feed all of their fish (or erasers) to their monster, wins. Without anything added, plastic links make a great fine motor activity. Students love to see how long they can get their chains and often make a challenge for themselves by including intricate color patterns. 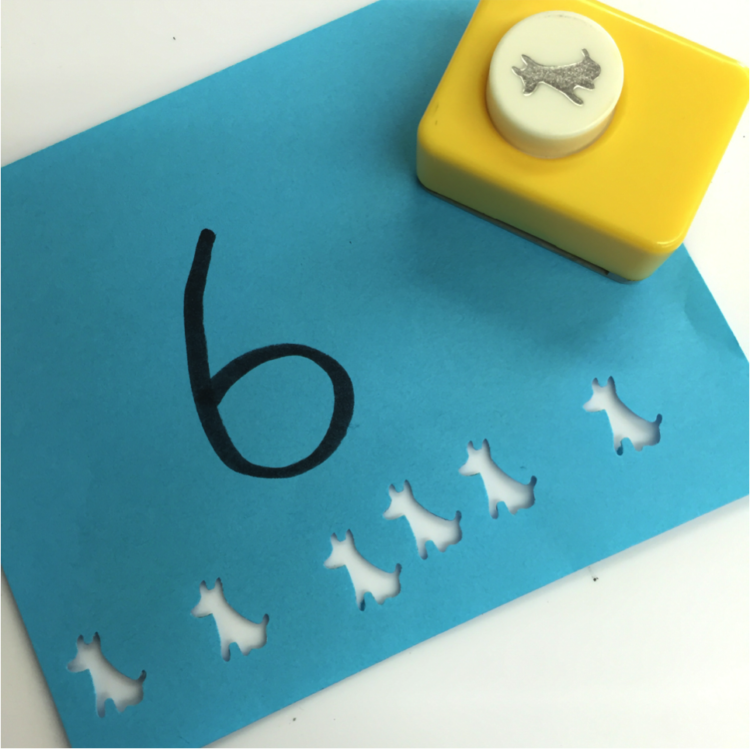 But if you add a few number cards with hole punches, it takes this activity to another level. 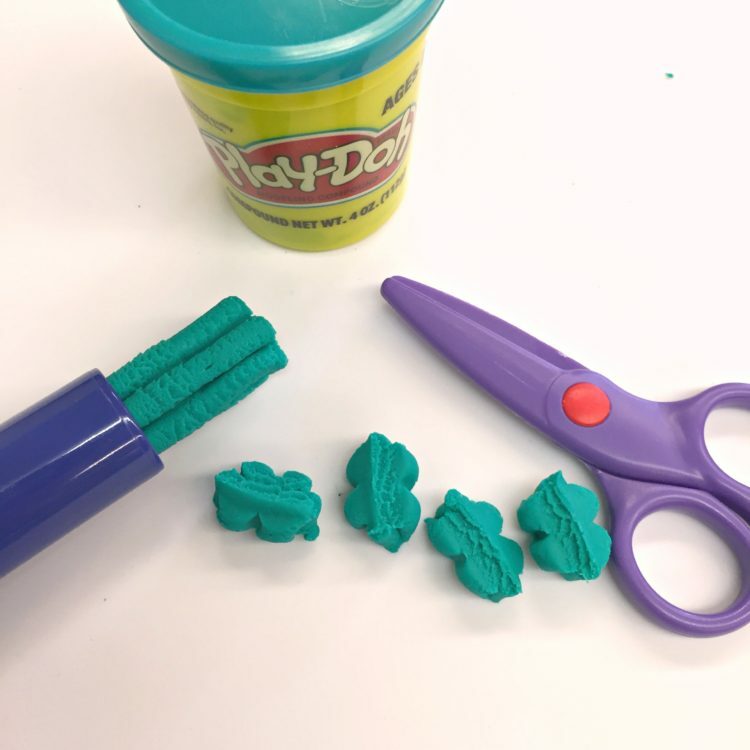 If you have an arsenal of play-doh extruders like the one below, you know how much your students love working that plunger with their fingers to push that dough through the different shapes. Although parents often poo-poo play-doh as being too messy, it’s one of the best tools for working those little hand muscles. Add a pair of scissors to snip of the extruded play-doh and it adds a nice resistance tot he activity. If you parents grimace when you give them activity, remind them of the importance of those finger muscles when their child starts writing and suggest they have them work on a small cookie sheet to control the excess play-doh pieces. 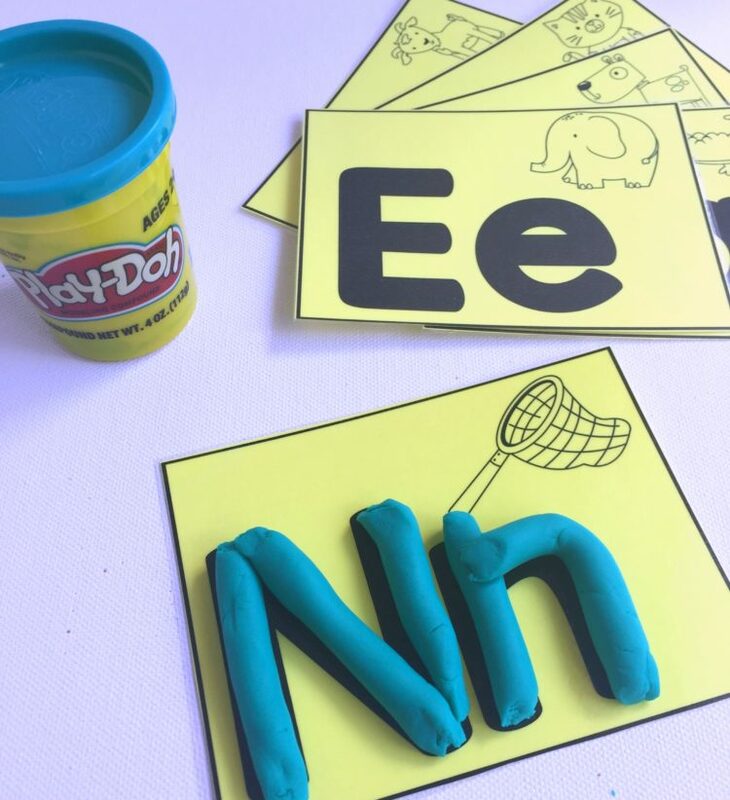 If you’d like to add a bit more challenge to this tool, copy off some mini ABC play-doh mats on Astrobrights card stock. I like to include only a few letters at a time–usually whatever letters that student has been focusing on in school. While you can use other putty for this activity, I’m always partial to therapy putty just because . . . well . . . it really is the best. It has the right amount of resistance and it’s super stiff which you really want. I especially like it, because it lasts forever. Sure you can use something like Silly Putty in its place, but I find that I would have to purchase 3 or 4 containers of Silly Putty to equal what I can get from one container of therapy putty. 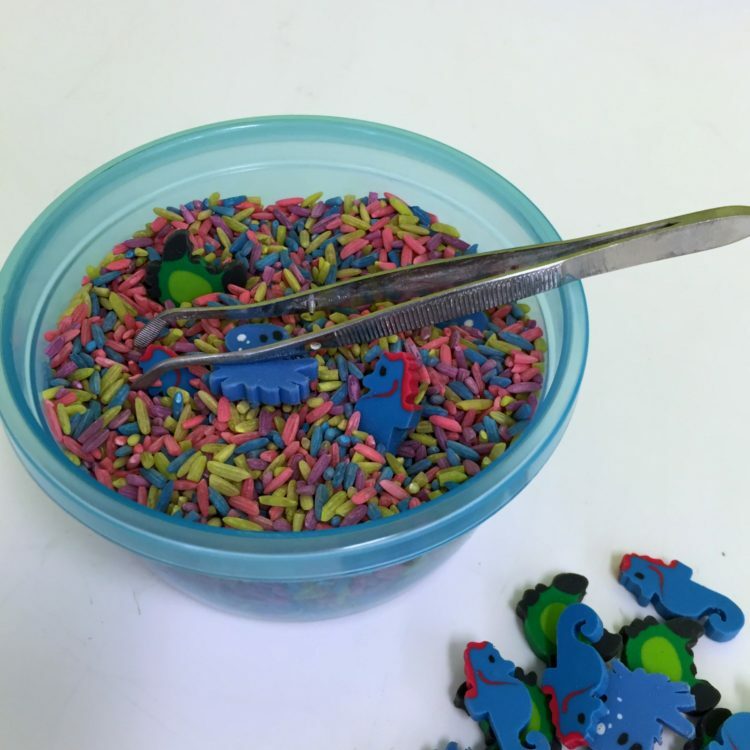 For this kit activity, I like to hide beads, colored pony beads or even letter beads if you have them, inside the putty. 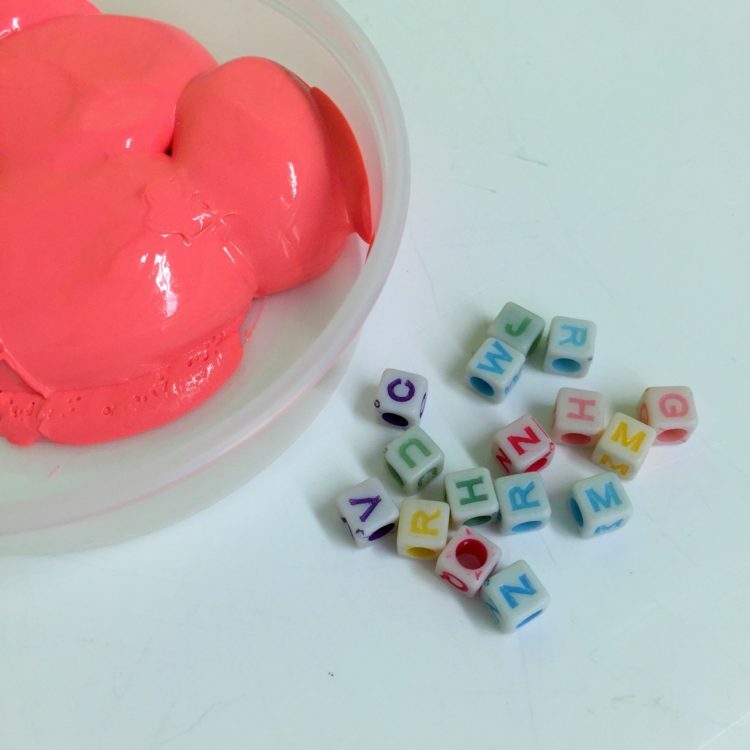 Students can search the putty, naming the letters as they find them, or you can see if they can use the letters to make words or spell their name. For this activity, I have students time themselves to see just how long it takes them to find all the nuts that match the bolts in the kit. They need to twist the nuts all the way on the bolt for it to count. Then I time them to see how long it takes them to get them off. They enjoy seeing if they can better their time with each try. Button type paper punches are also a good way to build up fine motor strength while engaging your students. Just punching the paper is really a challenge. But if you’d like to add a spin to it, label several different sheets of colored Astrobrights paper (colored paper makes everything more fun) with a number and have students ‘punch’ that many times. You’ll find thematic button punches like these at craft stores, but I generally can pick them up from garage sales here and there as well. 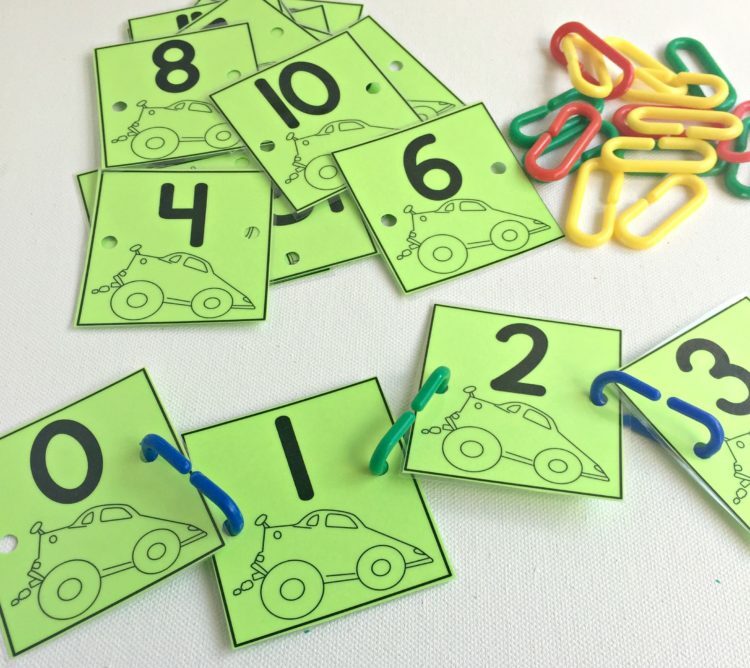 While I would LOVE to send anyone who wanted one of the kits one of their own, the least I can do is get you the printable task cards, brochure, number link cards and mini ABC play-doh mats. Just click below and enter your email. A verification email will be sent to your inbox, but sometimes it likes to hang out in your SPAM folder. So if you don’t see it in a few minutes, check there.) Once you have verified your subscription to my mailing list, your file will be downloaded to your computer. Just check your ‘download’ file on your computer and you’ll probably see it there. (If you’re looking for the ABC punch cards, you can find them on my side bar — right there on the right hand side of my blog — for free!) I sure hope this gives you some ideas and help in getting your kinders finger ready for fall. Enjoy! 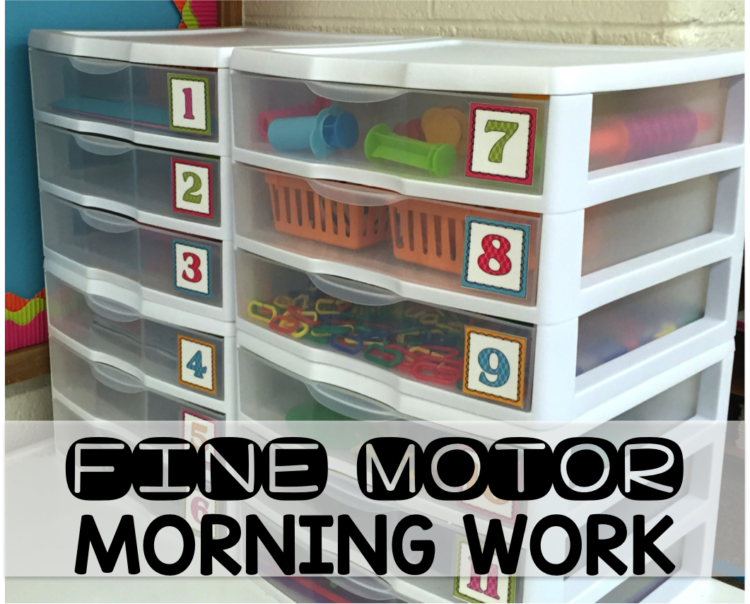 If you’d like so see a whole series of monthly fine motor morning work station ideas and free printables, please check out my other fine motor blog posts, starting with Fine Motor Morning Work Stations! You can get there by clicking the picture below or by going HERE. I would love a copy of the brochure and task cards for my Head Start preschoolers! It’s available. Just follow the directions in the blog post to get yours for free. 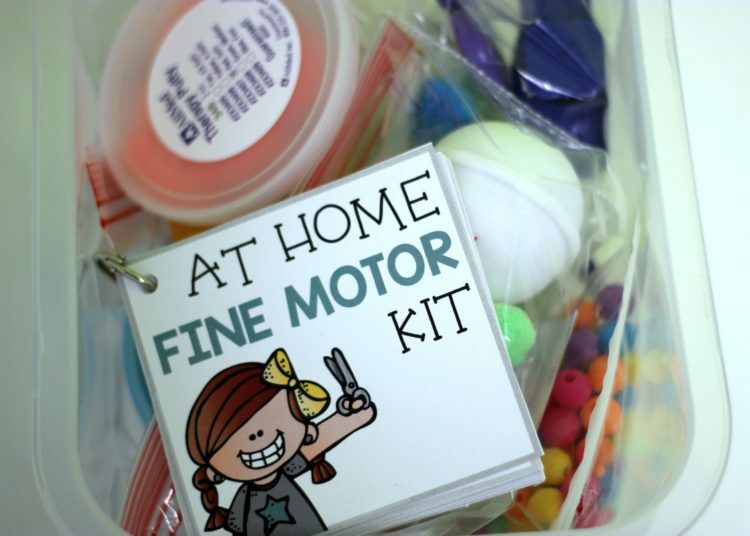 Do you have a version of the fine motor brochure to purchase/download? If you follow the link, it will take you to the blog post where you can get if sent to you for free. Love these ideas! I’ve already added some pop beads to my cart on Amazon. Did you see they have alphabet ones as well? So great for adding fine motor into literacy centers! I do now! They are in my cart. Thanks for sharing. These are great ideas for a KG teacher. I teach Title 1 and could really use this also. Am I missing a link for purchase or download of the brochure and ideas? If you click the button at the bottom of the post you can have it for free. Awesome post Marsha! It gave me lots of ideas since I am being moved from first to K and I am excited! Your blog is amazing and I have it in my RSS feed and enjoy it very much! These are great ideas and could be used as table activities for the beginning of the day. I love your fine motor kit and would love to make a couple for my class. Thanks for sharing your great ideas! You have included so many great ideas that are not just fine motor. There is literacy, numeracy, and visual perceptual skills. Thank you so much for sharing. I love this idea! Where did you get the paper strips for punching out the letter sounds? I teach a small group of pre-Ks for a week before school starts. This would be a great gift for the end of the week. Just take a look at my blog’s side bar. You’ll find them for free there. I LOVE this idea!! One of the very best posts I have read anywhere in quite a while! I’m going to use this in my Kinder class this year. Thanks so very much!! The activities in the kit are wonderful! I teach lower K-2 children with special needs and we try to get in as much fine motor work as possible, not only because we have difficulty writing. 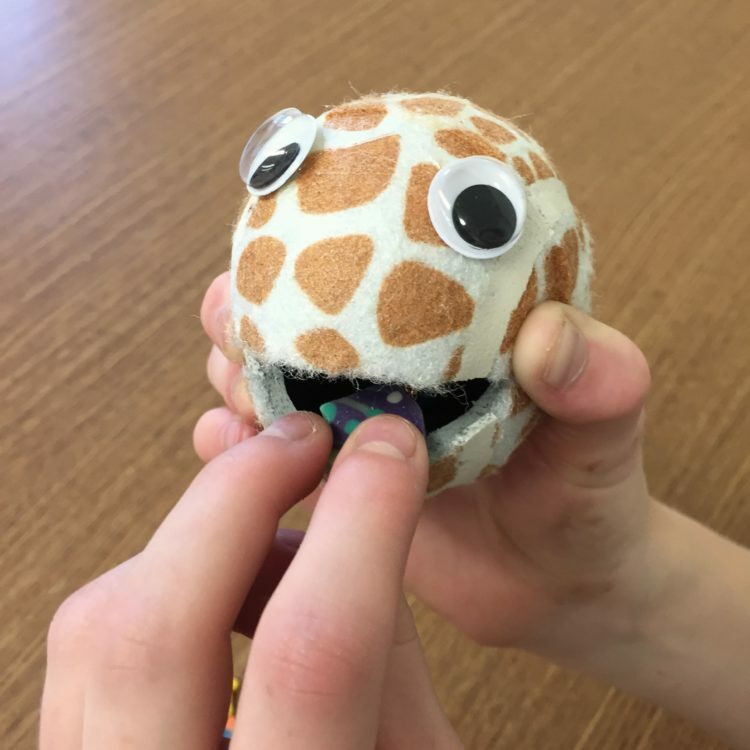 Fine motor skills are connected to articulation and my students are working on those skills as well. We have used some of these activities, but it is always helpful to have additional tools in our toolbox. 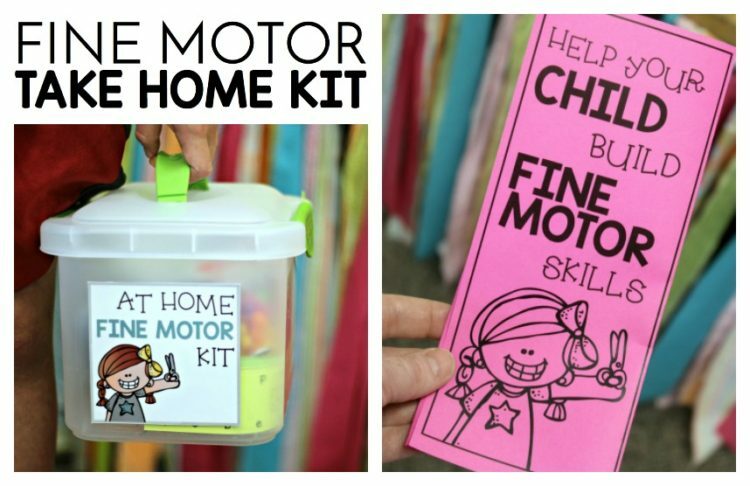 This fine motor kit is such a great idea! I love it! Thanks for sharing. I signed up for the freebie, but nothing has come through…even in my spam. Would you mind sending it to me? Thanks so much! These are FANTASTIC ideas — a few of which I knew about, but you have many great ideas and I plan to steal and use them all. Thanks so much! My kinder babies need all the fine motor help they can get. 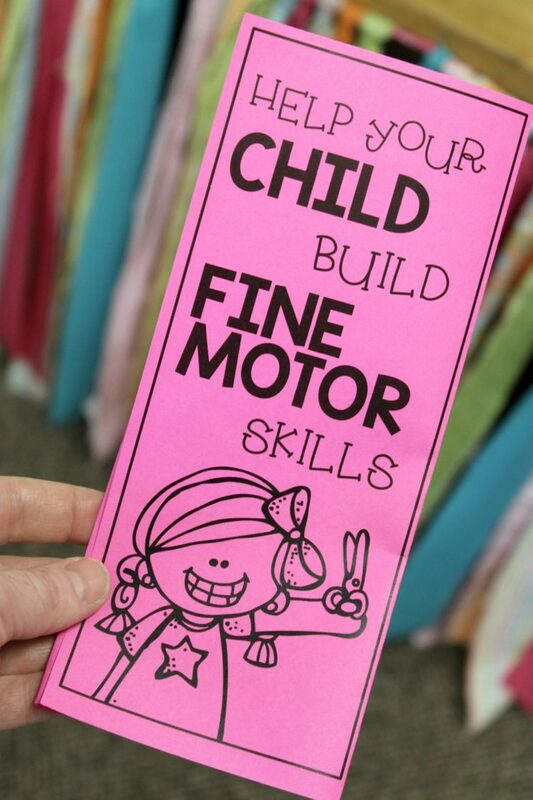 Do you have a printable copy of the fine motor brochure? Just click on the button at the bottom of this post. It will be sent to you. I would love a copy of the brochure and the task cards. Great planning and organization!! Thanks for sharing. Just click on the button at the bottom of the article and it will be sent to you. I love this take home kit! This is EXACTLY what I have been thinking about creating in my classroom. Have I told you lately that you are awesome! I am a HUGE fan of what you do. Thank you for sharing your talents! Marsha, this is AMAZING! Thanks so much for sharing. It seems I always have at least one little who needs help with fine motor skills. We work on those skills at school and I recommend some things to do at home but I always wish I could offer a little more guidance for the parents. This is such a blessing for me. Thank you!. 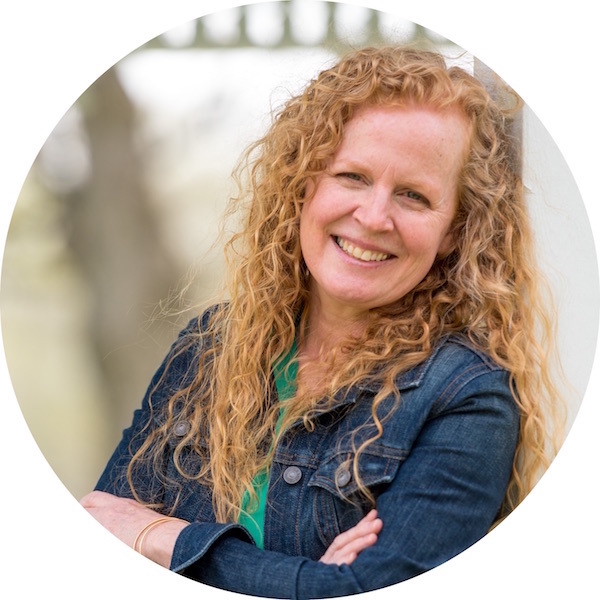 Hi Marsha – thanks so much for the freebie download! How many of these kits do you have prepared at the beginning of the year? I don’t want to spend time/resources for something that won’t get used, but want to have one for everyone who needs a little extra support. I’m thinking 2? Maybe 3 kits? 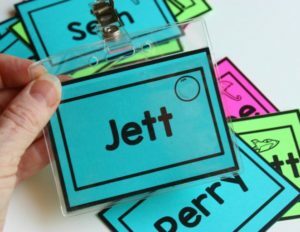 As a school OT, I think this is a fantastic idea and can’t wait to replicate it! Thanks a ton. That means a lot. 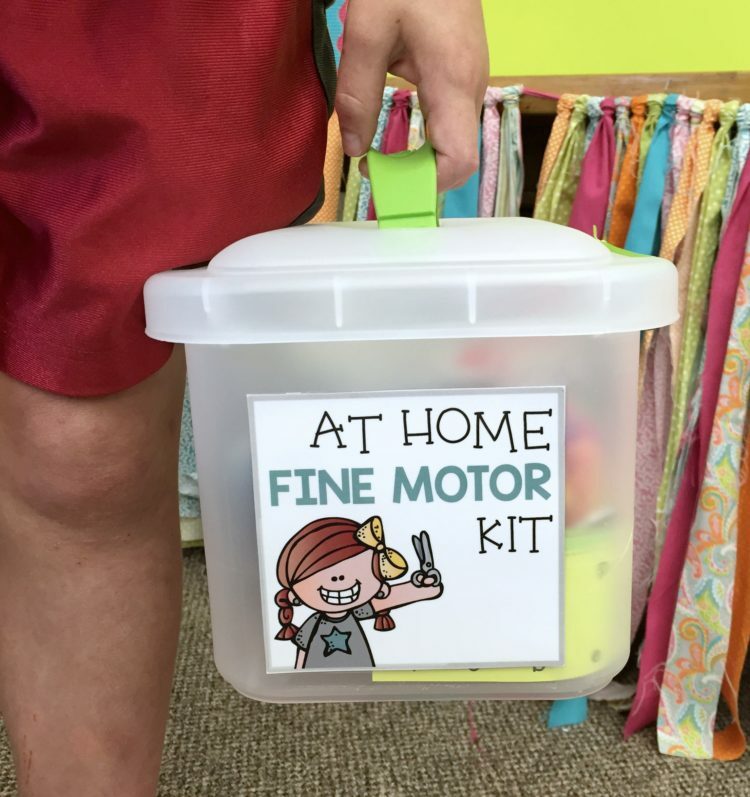 i would love a copy of your fine motor kit information! I am a huge fan of your work and I absolutely LOVE this post! My students this year definitely need a boost with their fine motor skills so I am gathering things to create some kits. 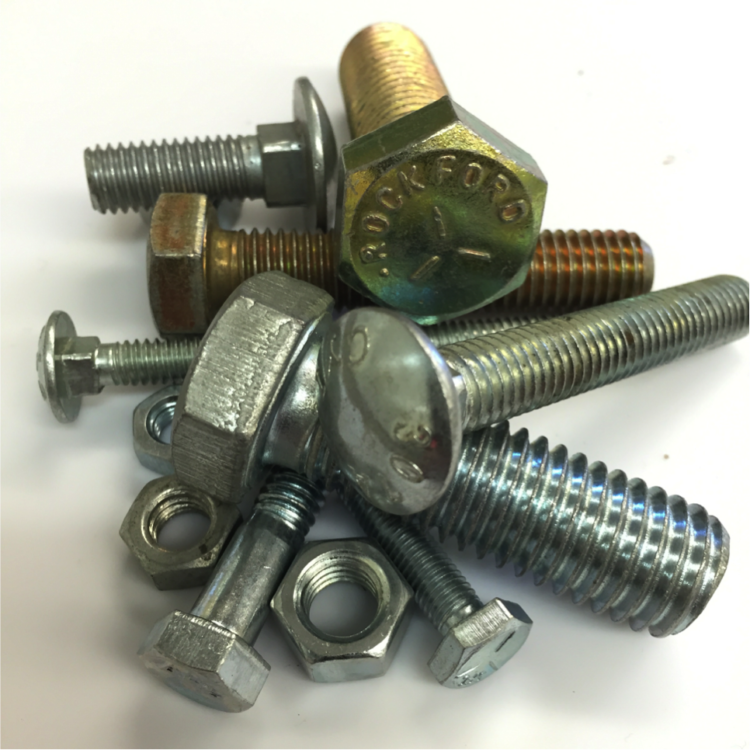 I have just a few questions for you… Do you have any suggestions about how many pop beads, nuts & bolts, etc. to put in each kit? Also, do you have any recommendations about how to organize them (baggies, bowls, etc.)? THANK YOU SO MUCH for sharing your amazing ideas and for the freebie! What an amazing time saver! I like to organize things in small containers if possible. Baggies get torn up and they can’t close them. You need about 10 sets of nuts/bolts and maybe 30plus beads or so. That seems to be adequate. Thank you so much for this kit! I am so excited to put it together and send home with students! Awesome work! 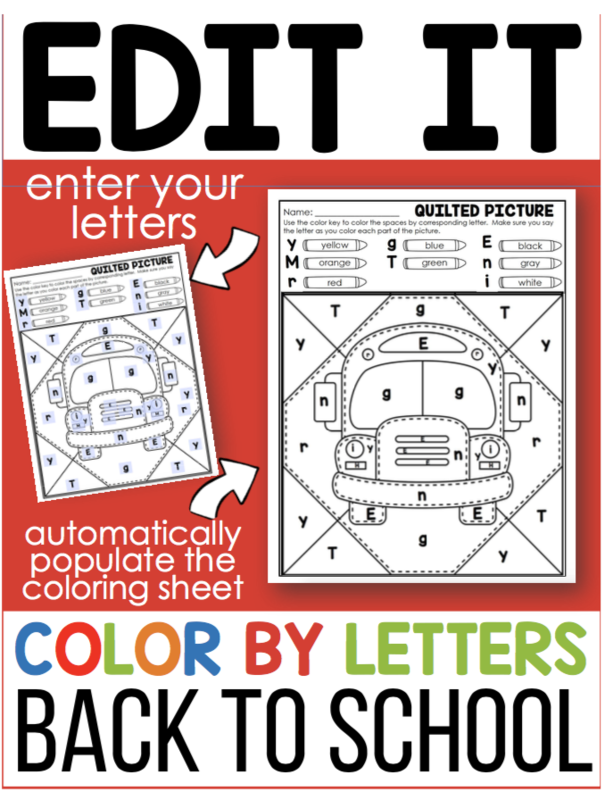 It’s available when you sign up for the fine motor kit printables. I just found your blog, and I am so excited to make a fine motor kit! What an awesome idea! I always have several kiddos who need a little boost in this, and this will be perfect! I didn’t see the hole-punch letter sounds included in the kit. Did this get missed in the upload? I would love to be able to include this too. Thanks so much! Look to the right side of my blog on the side bar. It’s free. Thank you! I will get this all together for some of my hospital/homebound students! You’re great! I am sooooo excited about this helpful post! I am anxious to print this to start using with my son. I followed the directions and received the PDF, but I am unable to print for some reason? Is there any reason why this could be happening? Try it on a different computer. Sometimes there are computers that don’t allow you to download and print (especially school ones) but otherwise you should be able to no problem. Love this! Thanks for the free download! Hello! Do you have a PDF for the punch a letter sound sheets? They were not included with the fine motor kit PDF. Thanks! I would like you to send me the free task cards, abc punch cards, number link cards etc. love all your ideas. Can’t wait to try next year ? 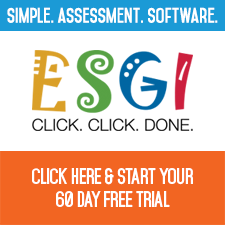 just use the sign up form in the blog to get your free download.